It started in October 1998, there were a group of about 12 of us, only a few of whom were acquainted. The location was the Claddagh Irish pub, now no longer with us, on Westheimer Road here in Houston. The occasion that had drawn us together was a taped re-run of a UEFA cup tie, Bayer-Leverkusen v Rangers. The “us” I refer to were Rangers supporters, all watching the taped game in the pub which was home to the Houston C.S.C! Personally, this was my second visit here since arriving in Houston that September, and Jim Beckett, Max Hogg, Duncan Walker and myself decided that enough was enough. It was clear from comments made at the time that there were enough Bluenoses around town to give Houston it’s own Rangers Supporters Club. 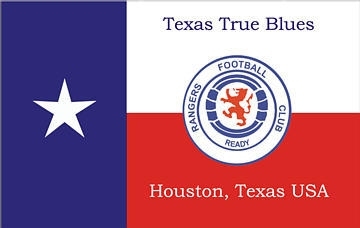 About a week later I read an e-mail on one of the Rangers mailing lists from Dave Barr of Vancouver RSC Branch 2, stating that some bears in Houston were trying to get a supporters club going. After replying to Dave’s e-mail, I was soon in touch with Iain Clark, Stephen Mayor, Archie Begg and Stephen Begg. We arranged a meeting which took place at the Westcrest Pub in early December, attended by Jim Beckett, Iain Clark, Stephen Mayor and myself. We decided to produce a flyer for distribution at the upcoming Ne’erday game, which we would be watching in the company of our good friends from the Claddagh! Following the match, a 2-2 draw featuring a fantastic goal from the head of Gabriel Amato, 16 of us made our way to the Houston Brewery to get things moving. After the meeting we had 18 confirmed members, another 5 possibles and a name, “The Texas True Blue Rangers Supporters Club”. The next step was to find a suitable bar to call home. After about a dozen “recce” missions involving a few willing souls, (a thankless task, but someone had to do it! ), we approached Rudy at Big John’s in southwest Houston. After confirming that we were NOT the same group who frequented the Claddagh on a weekly basis, Rudy was keen on ensuring that we would base the Texas True Blues at Big John’s. All of which led us to January 30th 1999, when we screened our inaugural match, Aberdeen v Rangers from Pittodrie. I remember being as nervous as hell that morning in case anything went wrong with the broadcast and we fell at the first hurdle. But everything went without a hitch, we had an attendance of 33 bears and Rangers won 4-2, all in all a great start for the Club. That game also saw Rangers start on a charge that would lead to the Championship being won in the east end of Glasgow on a Sunday afternoon in May, a day that Hugh Dallas local glazing company will never forget! Since that day, like every other Club, we’ve had our ups and downs, some of the ups would be…………..the 4-0 Cup Final against Aberdeen which gave the Rangers their 100th major trophy………….May 25th 2003, Rangers 6 Dunfermline 1 which gave us our 50th League Championship…………..some wonderful European nights, including 2-0 v Parma, 4-1 v PSV and more recently 2-1 v Stuttgart, and who could forget………..Helicopter Sunday !!!!! Recalling the 4-0 victory against Aberdeen in 2000, prior to the game the TTB’s had ordered some commemorative “100 Major Trophies” t-shirts, as well as special “Oranje day” shirts, which were plain orange with a blue Lion Rampant TTB crest. Houston, as an oil town, has a large number of “woolly residents” and we were expecting a large turn out from them on the big day, and, as it turned out, the crowd was split almost 50-50. The plan was for all of us to wear our “Oranje day” shirts and hold back the “100 Major Trophies” shirts in readiness. If I remember correctly, after Rangers went 3-0 up, Davie Hendry was the first to change shirts, this led to a rush of orange shirts being replaced by white ones with the 100 trophies logo, the looks on the faces of the Aberdeen fans would have made for a great MasterCard commercial………priceless!!! Another great memory, which is not directly football related, would be an auction held in late 2001 to benefit the FDNY widow’s and orphan’s fund. This took place immediately following an Old Firm match, before a fairly good crowd of members and non-members, and for me sums up what the spirit of this Club is and should be all about. A total of over $3700 was raised that day for this most worthwhile charity, a credit to all those involved and a wonderful effort from a Club with fewer than 40 members. This, in fact won us the prize for the NARSA club to raise the most cash for the benefit. The prize, a framed Iain Ferguson jersey worn during the League Cup Final victory against St. Johnstone in 1998-1999 season still hangs in Big John’s today. The Texas True Blues also had the honor of hosting the 11th NARSA Convention in Houston during June 2003. This event was a major undertaking for a Club of our limited size and experience, but was a great success, attended by approximately 700 Rangers supporters from all over the world. The event featured trips to The Alamo and Space Center Houston, as well as the Davie Cooper Memorial Golf Tournament at the fantastic Tour 18 course. But like every NARSA Convention, it was centered around the NARSA AGM and the Saturday night Banquet. The Banquet was MC’d by Donald Findlay QC, a true gentleman and diehard Bluenose if there ever was one. After the speeches and formalities, Donald took great pleasure in assisting Rangers Chairman John McClelland in lifting the SPL Trophy on to the head table, a surprise which brought the house down!! As well as Donald Findlay and John McClelland, the Convention was attended by regulars Martin Bain and Sandy Jardine plus nine in a row heroes, Hateley, McCoist, Durrant, Goram and Bomber Brown, who along with the Bears themselves, all contributed to make it a great 5 days with some great memories. It’s been an amazingly fast nine years, and the Texas True Blues are still going strong, so if any Bluenoses find themselves in Houston, now or in the future, make your way to Big John’s where you will find yourselves welcomed with open arms. God Bless The Rangers and The Texas True Blues.